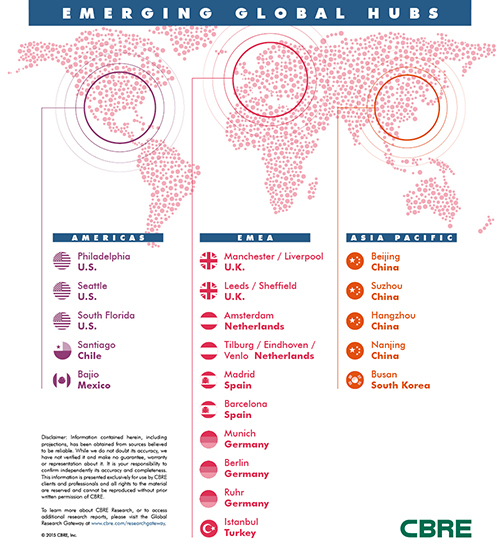 CBRE recently issued a report, “Global and Emerging Logistics Hubs,” that identifies 30 logistics hubs that play a key role regional and global supply chains. 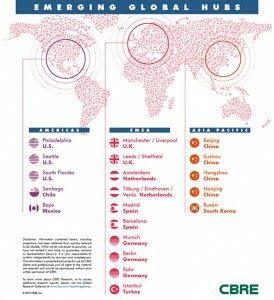 The report also points to 20 emerging hubs that may become global hubs over the next decade. The report identifies current global logistics hubs around the world, including nine in North America, five in Asia, and 11 in Europe, the Middle East, and Africa (EMEA). They include the large hubs of Hong Kong, China; Singapore; Antwerp, Belgium; and Hamburg, Germany, and smaller but influential hubs like Toronto, Canada; Monterrey, Mexico; Tokyo and Osaka/Kobe in Japan; Dubai, United Arab Emirates; and Moscow, Russia. The emerging logistics hubs include Amsterdam, the Netherlands; Busan, South Korea; Seattle, Washington, USA, the Bajío region of Mexico (home to the growing industrial centers of Guanajuato, Querétaro, Aguascalientes, and Jalisco); Istanbul, Turkey; Santiago, Chile; and Philadelphia, Pennsylvania, USA. –Infrastructure investments. For example, the construction of a deep-sea terminal at the Port of Liverpool, England, UK, which could potentially turn the Manchester/Liverpool area into becoming a global hub. –Trade policy. the report notes that Chile’s 24 trade agreements with 63 countries is helping to push Santiago from being a small, regional hub to becoming the main distribution location in western South America. –Demographics. The rise of the middle class in emerging markets, particularly in Asia, is a major factor behind the increase in logistics hubs in those regions. CBRE forecasts that Shanghai and Shenzhen will retain their importance and be joined by other cities, such as Beijing, Hangzhou, Nanjin and Suzhou. –Global supply chain shifts. As manufacturing capacity moves, logistics capabilities will move with it. For example, the Bajío region of Mexico has become a hub for automobile production and concurrently grown in importance for global and North American logistics operations. –e-Commerce. As companies struggle to respond to demands for same-day or next-day delivery to fulfill e-commerce orders, new locations will come to the forefront as key logistics hubs. For example, Philadelphia, Pennsylvania’s rise in importance is being driven by its access to over 100 million people within a one-day drive of the region.